The Potter's Bench offers plenty of work space and comes with a waste lid to make soil cleanup easy. There's also a large lower shelf for supplies. 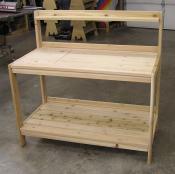 It can serve as a working bench or a decorative plant stand. It measures 24" x 48". The table top stands 32" high. The back is 46 1/2" high and holds a 4" wide shelf. Too big? Too small? Do you have special needs? Give us a call and we'll work with you to design and build exactly what you need.